Former Drugs Squad officer Dave Parvin took education from the classrooms in Bognor Regis on to the streets. 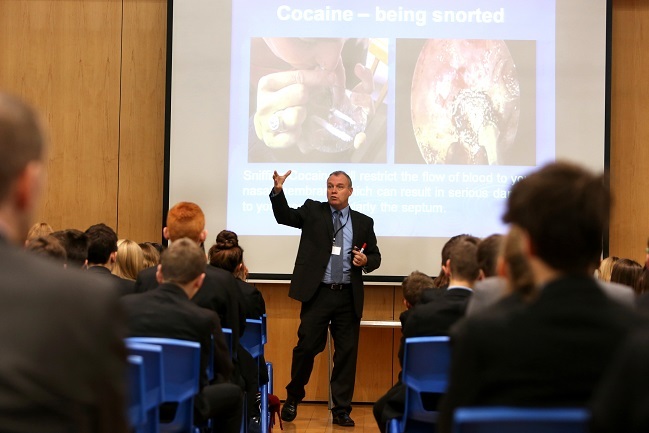 Mr Parvin gave students at The Regis School the latest information about drugs and their effects in a series of seminars. All of the some 1,700 pupils attended the sessions. Among them were Pheobe Reeves and Josh Patterson. Pheobe, 13, said: “I found the seminar really powerful. This type of stuff is aimed at our age groups. “It was so interesting what type of stuff goes on. We don’t think what the consequences and the risks are. “We don’t really understand what can happen to us because we are only 13 or 14. We don’t understand what we are doing to ourselves at times. Josh, 15, said: “It was nice to have a different point of view about drugs to our teachers. We heard about ecstasy, cannabis and cocaine. Mr Parvin spent 12 years as a Drugs Squad officer in Yorkshire and several other counties. He has been staging seminars in schools for the past 13 years and updates his knowledge to ensure it remains relevant. He said: “The days of preaching about drugs have gone because that never worked. It’s now about using the hour I have with the students to put over information which is going to have an extremely important effect on their lives. “I want them to know the risks involved with the drugs that are likely to come in contact with. They need to know that they are dangerous. It was also vital to involve parents as well. Many of them attended an evening session he held at the school. Katie Robinson, the school’s team leader for personal, health, citizenship and social education, said: “Dave brings a wealth of knowledge to these sessions. School principal Mike Garlick said: “I can protect children inside school and it’s important I provide them with the information about what life is like outside it.